Virtuosic music for viola da gamba solo is almost immediately associated with the names of French composers, such as Sainte-Colombe, Marais and Forqueray. More knowledgeable music-lovers will probably also think of Diego Ortiz (Spain, 16th century), Tobias Hume and Christopher Simpson (England, 17th century) or Carl Friedrich Abel (Germany/England, 18th century). The name of Johann Schenck is far less known, although he is not badly represented on disc. Little is known about his early years. Although it is mostly assumed that he was born in 1660 in Amsterdam, that cannot be documented with absolute certainty. We know a painting which is thought to be a portrait of him - it is also on the back of the present disc's booklet - but some see a strong similarity with portraits of the French virtuoso Marin Marais. We are also in the dark about the identity of his teacher. It could have been Carolus Hacquart, a gambist and composer who was born in the Spanish Netherlands, but settled in Amsterdam in the early 1670s. What we do know, however, is that Schenck played a key role in music life in Amsterdam. He composed what is considered the first opera in the northern Netherlands, and wrote a number of songs on Dutch texts. The largest part of his oeuvre consists of music for his own instrument. He developed into one of the greatest virtuosos of his time. During his career no fewer than ten collections of music were printed, all in Amsterdam, mostly by the well-known publisher Estienne Roger. His first opus with music for viola da gamba is the collection which is the subject of the present disc, the Tyd en Konst-Oeffeningen. The word oeffeningen - exercises - should not give the impression that this is easy stuff, although it was probably written for amateurs in the first place. We know that many amateurs had considerable skills and the publication of music which was unplayable for amateurs was hardly profitable. It is only in his last publications that the music is likely to have been beyond their grasp. The collection includes fifteen suites for viola da gamba and basso continuo. They comprise a number of dances with French titles, among them the four which had become the standard in this kind of suites: allemande, courante, sarabande and gigue. However, Schenck didn't exclusively follow the French taste. He was a representative of the goût réuni, the mixture of French and Italian elements. The suites all open with a movement in the Italian style, often a sequence of adagio, allegro and adagio. Several suites include a ciacona, and the Italian title is not chosen indiscriminately. These are highly expressive pieces with a theatrical flavour. That comes off perfectly here. Lixsania Fernández, born in Cuba and largely educated in Spain, delivers passionate performances and fully explores the expressive qualities of the slow opening movements. The very first track of this disc - a sequence of adagio-allegro-adagio which opens the Sonata No. 9 - is a telling example. The sarabandes have the same expressive qualities. In the fast dance movements the rhythmic pulse is impressively realized, with the dynamic accents played in such a way that some listeners might find it hard to keep their feet still. There is just one minus: there are too few breathing spaces between the phrases. Often the last note of a phrase has hardly faded out when the next phrase begins. That sometimes results in a kind of short-windedness; some movements sound a little too abrupt. However, that has hardly spoiled my enjoyment. This is great music, and it seems that this is the first time a complete disc has been devoted to this collection. That in itself is reason to celebrate. 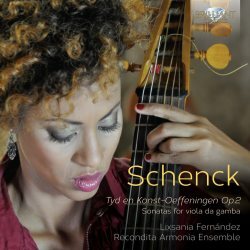 Lixsania Fernández and her colleagues have served the music very well and done every lover of the viola da gamba a great favour. I very much hope that the remaining pieces in this collection will be recorded as well.